In 2013, a new class of magnetic compounds, i.e. Mn-based (M = Mn) magnetic MAX phases was discovered. MAX phases – in general are atomically layered composites with unique properties ranging from spectacular mechanical properties to self-healing and superconductivity. We performed a comprehensive suite of studies exploring magnetic phase transitions, structural transformations, electrical transport and magnetic properties in the Mn2GaC MAX phase. It has the highest magnetic ordering temperature of 507 K observed in magnetic MAX phases so far, and the spin structure is driven by competing ferromagnetic and antiferromagnetic interactions. The fundamentally new property is the sign change of the large magnetostriction of 450 ppm (only four times smaller than Terfenol) being compressive (negative) at ambient temperature and tensile (positive) below 214 K. A corresponding sign reversal is observed in the magnetoresistance. In thermal equilibrium the solubility of interstitial Boron in bcc Fe-Co does not exceed 0.1 at.%. The solubility limit can be significantly increased using non-equilibrium preparation methods such as pulsed laser deposition (PLD). In our recent paper published in J. Phys. : Condens. Matter http://iopscience.iop.org/article/10.1088/1361-648X/aa7498/meta we use PLD for deposition of Fe-Co and achieve doping levels of up to 4 at.% of interstitial B. The films are tetragonally distorted and show improved magnetic properties. The tetragonal distortion yields a large magnetocrystalline anisotropy energy (MAE), which is an important issue in designing materials for permanent magnets. Furthermore, we identify an enhanced influence of spin-orbit coupling (SOC) as seen from the increase of the orbital magnetic moment and spectroscopic splitting (g-) factor compared to cubic and un-doped Fe-Co. These results are essential to understand the influence of SOC on the magnetic properties, which are crucial for applications in spintronic devices, logic systems, tunneling magnetoresistance elements, where Fe-Co and Fe-Co-B alloys are widely used. We also show that the magnetic damping parameter decreases with increasing B concentration making these materials attractive for magnonics applications. a) Tetragonal distortion quantified by the c/a ratio of lattice constants (black circles and left scale bar) of 20 nm thick Fe-Co-B films prepared by PLD with different B concentrations. The g-factor, which represents the admixture of orbital moment to the total magnetic moment (blue squares and right outer scale bar), follows the c/a ratio indicating that reduced crystal symmetry and interstitial B leads to an enhancement of the effect of SOC in the Fe-Co-B. The out-of-plane MAE (red triangles and right inner scale bar) is highest at largest c/a, however, it nearly vanishes at 10 at.% B showing the strong influence of the film microstructure on MAE. b) This influence can be seen from the correlation of the in-plane MAE of Fe-Co-B films (blue squares and right outer scale bar) with the decrease of crystallite size determined from x-ray diffraction (black circles and left scale bar). Since the MAE decreases with decreasing grain size, the coercive field of magnetic hysteresis loops measured along the in-plane Fe-Co  easy axis also decreases as seen in the figure (red triangles and right inner scale bar). Two-dimensional materials are of great interest for application and basic sciences due to their sometimes very special properties, like linear dispersion relation in Graphene. Together with our colleagues from the Drexel University (M. Barsoum et al.) we have investigated and published the conductivity of a clay made of two-dimensional Ti3C2 MXenes, which were in a first step produced as volume like material. Using an etching process, two-dimensional flakes were produced. The influence of the surface termination of these flakes was than investigated by measuring the resistivity after oxygen and hydrogen plasma treatment in situ. We were able to reduce the resistivity by 20% from the oxidized to the reduced state. In addition we found out, that these structrues are excellent humidity sensor. They change their conductivity by a factor of 26 when increasing the relative humidity from 0% to 80%. 2016-12: Additive manufacturing: A skyrmion which you can take in your hand! Using 3D printing technology in the group of Prof. G. Witt and MuMax³ micromagnetic simulations by B. Zingsem (Ag Farle) Dr. J. Sehrt created a magnified 3D topological structure by additive manufacturing. The coloring was handmade by N. Josten. The cones indicate the direction of magnetic moments as they twist by 180 degrees from the center to the rim. The world-wide market for permanent magnet (PM) materials is rapidly increasing due to their widespread applications in consumer products, electrical generators (e.g wind power), and motors (electrical vehicles) as well as biomedical applications. The majority of current PMs consist of alloys including a significant amount of rare-earth (RE) elements and require a high energy product with a huge coercive field and a high remanent magnetization. Reporting in Nanotechnology, researchers investigate the alternative option of using purely 3d transition metal based magnetic nanowires for PM applications with better sustainability, availability and lower prices. We succeeded in measuring a system of 20 separated Fe/FexOy nanocubes (about 30nm in size) by Ferromagnetic Resonance. The effective magnetocrystalline anisotropy field of 2K4,eff/M = 50mT ± 5mT is smaller than the one of bulk Fe. The effective damping parameter α = 0.0045 ± 0.0005 matches the values of high quality iron thin films indicating that measurements on nanoparticle powders can give quite erroneous results due to dipolar coupling and inhomogeneous linewidth broading. Numerical calculations. 2016-07-15: A new approach to light-weight and low-cost ultrahard permanent magnets ? Coercive fields exceeding 5T can be attained in an off-stoichiometric Ni-Mn-In Heusler by temper-annealing. 2-5nm Ni2MnIn shell-ferromagnet (fm) precipitates embedded in a NiMn antiferromagnetic (afm) matrix are formed (Figure a). Even though the magnetization loop (Figure b) is a minor loop, the coercive field already exceeds 5T. It is estimated that around 20T is required to rotate the shell spins fully. This makes the material very interesting for permanent magnet and magnetic storage technology. To view the phenomenon live at macroscopic dimensions visit https://www.youtube.com/watch?v=0VlSksW2G-s .
We developed a scanning transmission x-ray microscopy setup combined with a novel microwave synchronization scheme for studying high frequency magnetization dynamics at synchrotron light sources. The sensitivity allows the detection of small changes of the magnetization at short time scales with nanometer spatial resolution. Our instrument is capable of visualizing spin dynamics in the 5-10 GHz range. When used together with circularly polarized x-rays, we can measure element-specific ferromagnetic resonance (FMR) and spin wave patterns with 100nm resolution in small geometries. Schnappschuss einer OOMMF-Simulation zur Bestimmung von FMR-Spektren. Durch die fortschreitende Verbesserung im Bereich der Computertechnik wird es ermöglicht, komplexe Systeme mit einer immer größeren Genauigkeit zu simulieren und so Vorhersagen über deren Verhalten treffen zu können. Ein besonderes Interesse im Bereich der Festkörperphysik gilt dabei den Berechnungen von dynamischen/statischen Zuständen eines magnetischen Probensystems. Im Folgenden wird eine Simulationsmethode vorgestellt, die im Rahmen einer Masterarbeit (K.Wagner) / Doktorarbeit (S.Stienen) etabliert worden ist. Als Grundlage dafür dient das Programm OOMMF (object oriented micro-magnetic framework), welches auf Basis der finiten-Elemente Methode arbeitet. Mit Hilfe dieses Programms lässt sich ein Experiment der Ferromagnetischen Resonanz (FMR) nachbilden, um so Aussagen über den physikalischen Ursprung der auftretenden Anregungsmoden machen zu können. Speziell bei der Behandlung von komplexen magnetischen Systemen ist dies hilfreich, da dort Anregungen häufig aus einer Superposition bestehen. Die daran beteiligten Einzelanregungen lassen sich auf Grund des integralen Charakters einer FMR Messung experimentell nur unzureichend bestimmen. Als ein Beispiel für dieses Verhalten ist hier die FMR-Simulation an dem Schriftzug "AG FARLE" dargestellt. Dieser besitzt eine laterale Ausdehnung von 4.6 • 1.1 µm2 mit den magnetischen Parametern für Permalloy. Das Video zeigt nicht nur den Zustand des magnetischen Systems, sondern zusätzlich noch das dazugehörige FMR-Spektrum. Angeregte Bereiche innerhalb eines Buchstabens lassen sich eindeutig durch eine starke blaue Einfärbung erkennen. Bei einem Magnetfeld von ca. 100 mT tritt im Spektrum eine resonante Absorption auf. Wie man in der Visualisierung der Resonanzmoden (blau bzw. rot) erkennt, setzt sich diese "Resonanz" aus dem Resonanzmoden der Buchstaben G,A,R,L, F, E zusammen. Imaginary part of the dynamic susceptibility (color-coded) as a function of the microwave frequency f and external field H0, calculated for three specific defect depths: h0 = 0, 1.5 and 3 nm, for a field applied in the plane, along the z direction ( = 0). A joint theoretical–experimental study focusing on the description of the ferromagnetic resonance response of thin films in the presence of periodic perturbations (i.e. a magnonic crystal) introduced on the upper film surface is presented. These perturbations may exist in the form of any kind of one- or two-dimensional rectangular defect arrays patterned onto one surface of the magnetic film. The components of the frequency and wavevector dependent dynamic magnetic susceptibility tensor of the film exposed to microwave excitation, are provided and are used to explain the experimental data. This allows us to obtain the response of the system due to microwave absorption and may be useful for future magnon logic devices. Description of figure: Imaginary part of the dynamic susceptibility (color-coded) as a function of the microwave frequency f and external field H0, calculated for three specific defect depths: h0 = 0, 1.5 and 3 nm, for a field applied in the plane, along the z direction ( = 0). The defect shapes are (a)–(c) stripes, (d)–(f) squares and (g)–(i) dots. For h0 > 0 additional branches appear in the resonant response with the strongest splitting for the film with stripe defects. In (b) and (c), the splitting appears at several fields: around H0 = 36, H0 = 70 and 150mT. The insets in the central column (a), (e), (h) show the angular dependence of the FMR response at a fixed frequency of f = 9.4 GHz (dotted line). The insets in (c), (f), (i) show the FMR response at f = 9.4 GHz as a function of H0 and the ratio between the defect width and periodicity wz/az .We use wz = 170 nm in (a)–(i) and a Py film thickness d = 30 nm. HRTEM (a, left) and 3D reconstruction images (a, right, and b-d) of the octahedra. Black arrows indicate the presence of voids inside the octahedra. In a collaboration with our colleagues from the university of Vigo ( http://webs.uvigo.es/magneticmaterials/) we could show that robust ferromagnetic order appears in CoO nano-octahedra at the interface to a thin Co3O4 surface layer. This ferromagnetic response persists even above the magnetic ordering temperatures of antiferromagnetic CoO and antiferromagnetic Co3O4. 2013-01: Light turns a corner ! Waveguide performance of the hierarchical trunk-branches CdS nanowires array probed by microphotoluminescence (µ-PL) with a continuous wave GaN laser diode (405 nm). Our Chinese colleagues (Prof. Bingsuo Zou et al.) demonstrate the Single-Step Synthesis of Monolithic Comb-like CdS Nanostructures with Tunable Waveguide Properties . Light entering the backbone of a comb-like structure is redirected internally to exist at the teeth of the comb. These micron sized structures may serve as new waveguide interconnects. Description of figure: Waveguide performance of the hierarchical trunk-branches CdS nanowires array probed by microphotoluminescence (µ-PL) with a continuous wave GaN laser diode (405 nm). (a) Optical microscopy image of the yellowish CdS comb structure on a Si wafer. The inset schematically shows the different illumination directions and areas of the UV laser (GaN laser diode at 405 nm wavelength). (b) Green photoluminescence with lateral (in-plane) illumination collimated at the trunk-branch junctions, (c) at the central part of the branches, and (d) vertically collimated as indicated by the white ellipses. Note that the arrows marked by B indicate the periodic emission of light resulting from the Fabry-Perot cavity for lasing; the arrows marked by A indicate the light emission from the end-tip of the branches. Ein Meilenstein in der Untersuchung von statischen und dynamischen Eigenschaften der Magnetisierung in dünnen Filmen ist mit dem Artikel "In situ multifrequency ferromagnetic resonance and x-ray magnetic circular dichroism investigations on Fe/GaAs(110): Enhanced g-factor" erreicht worden. Die im Rahmen der Doktorarbeit von Dr. F.M. Römer entwickelte, weltweit einzigartige Apparatur erlaubt die breitbandige Messung der ferromagnetischen Resonanz im Ultrahochvakuum. Dadurch wird ohne große Beschleunigerringe der Zugriff auf den g-Faktor erlaubt, dessen Anisotropie als Ursache für die magnetische Kristallanisotropie betrachtet wird. Es zeigte sich, dass Filme, die von Fachleuten allgemein als volumenartig gesehen wurden, ohne Abdeckung höchst interessante - eben nicht volumenartige Eigenschaften aufweisen. Hohes Potential versprechen sich die Forscher beim weiteren Verständnis des Einflusses einer Deckschicht. Untersuchungen auf die dynamischen Eigenschaften - z.B. durch den sogenannten Spin-Pumping-Effekt werden hierdurch zugänglich, da derselbe Film mit Vakuum- und z.B. Metallgrenzfläche untersucht werden kann. Mitarbeiter der AG Wende, AG Farle und AG Entel veröffentlichen in "Nature Communications"
Nanomagnete werden heutzutage vielerorts eingesetzt: in der Medizin genauso wie in der Datenspeicherung. Dazu müssen sie mal stark, mal schwach magnetisch sein. Wie man die winzigen Magnete mit ganz bestimmten Eigenschaften herstellt, haben Mitarbeiter der Arbeitsgruppe von Prof. Dr. Heiko Wende, Prof. Dr. Michael Farle und der Arbeitsgruppe Prof. Dr. Peter Entel soeben herausgefunden und ihre Ergebnisse veröffentlicht. Sie haben nun konkrete Regeln definiert, mit denen es möglich ist, schon bei der Herstellung der Nanomagnete deren Eigenschaften genau zu bestimmen. Dazu hat das Team aus der Experimentalphysik die Nanopartikel mit unterschiedlichen Metallen ummantelt und anschließend deren Effekt auf die magnetischen Eigenschaften der innenliegenden Partikel gemessen. Dr. Michael Stückradt (Staatssekretär im Ministerium für Innovation, Wissenschaft, Forschung und Technologie des Landes Nordrhein-Westfalen) beim Besuch des Exponates. Vom 19. bis 23. April 2010 wurden auf der Hannover Messe Branchentrends, neue Technologien und Materialien präsentiert. Auch in diesem Jahr war CeNIDE, das Center for Nanointegration der Universität Duisburg-Essen, wieder mit Exponaten auf der weltgrößten Industriemesse vertreten. Auf dem Gemeinschaftsstand des NRW Landesclusters „NanoMikro+Werkstoffe.NRW“ in der Research & Technology Halle zeigte das Cluster-Gründungsmitglied CeNIDE Chancen auf, die sich durch die Nanotechnologie und ihre möglichen Anwendungen ergeben. Auf besonders großes Interesse stieß der Ferrofluid-Brunnen, den Dipl.-Phys. Florian Römer aus unserer Arbeitsgruppe konstruiert hatte. Der Brunnen zeigte, wie sich eine Flüssigkeit, die winzige (10 Nanometer große) magnetische Partikel enthält, durch einen Elektromagneten beeinflussen lassen. 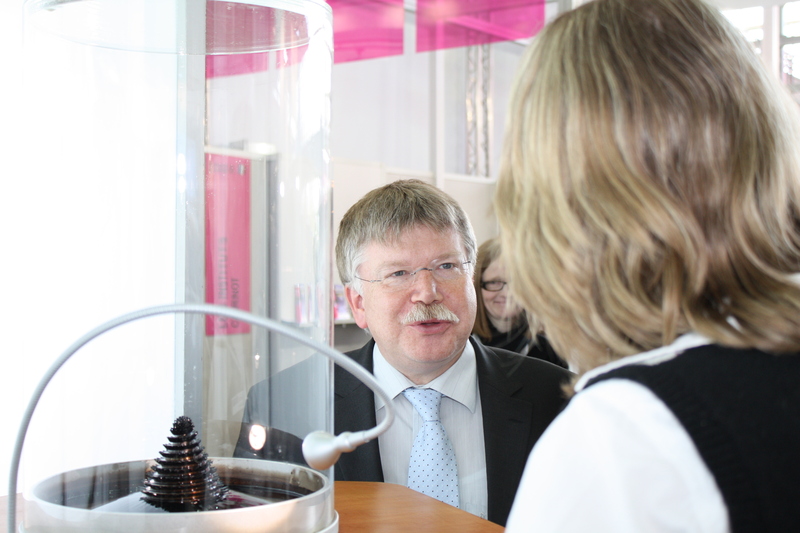 Auch Dr. Michael Stückradt (Staatssekretär im Ministerium für Innovation, Wissenschaft, Forschung und Technologie des Landes Nordrhein-Westfalen) zeigte sich beim Besuch des CeNIDE-Stands begeistert von dem Ferrofluid-Brunnen (siehe Foto). Measured Heightprofile of a wedge like Fe structure. There is a large thickness gradient in the area (a), which is the same where in figure 2 the ac-susceptibility peak is shown. ac susceptibility picture of the in maximum 10 ML thick Fe structure. Light grey is equal to no signal, while darker grey is the susceptibility peak. Only a small part, where the given thickness results in a curie temperature of in this case 245 K, is oscillating with the applied alternating external field. The inset shows a classical XMCD image at the same temperature. Here light grey is the magnetized part of the sample, while dark grey is the part of the sample where it's curie temperature is below the given temperature of 245 K.
Para-/ferromagnetic phase transitions require an infinite geometry in idealized theoretical descriptions. In experiments the extensions of a magnetic film are always limited. The question arises how the thickness dependent phase transition – well known in ultrathin ferromagnetic films – behaves when different phases interact in a wedge-type structure. To address this question we performed the first spatially resolved ac susceptibility measurements on epitaxial Fe films as a function of the temperature with a resolution of few tens of nanometers in an x-ray photoelectron emission microscope. As a function of thickness the curie temperature changes due to finite size effects. Our measurements were done on a wedge like structure of 10 to 0 atomic layers (ML) of Fe (see figure 1). The ac-signal appearing at the phase transition allows to estimate the spatial extend of the phase transition region and the correlation length, which would be diverging in infinite system. In figure 2 a typical ac-susceptibility image is shown. The "full with at half maximum" of the dark grey susceptibility signal extends about 0.7 µm. At this magnification one pixel is equal to 30 nm. The resolution of the PEEM is about 15 nm, which is not influenced by the design of our new sample holder and measurement technique. Future work is planned to measure the element-specific curie temperature of nano structured films , single nanoparticles and dipolar coupled nanomagnets. The work was supported by the Sonderforschungsbereich SFB491, DFG and the Helmholtzzentrum Berlin, Bessy II. We would like to thank H. Zähres for technical support and K. Ollefs and A. Ney for SQUID measurements. (a) Measured and calculated normalized XANES spectra of the Ga K-edge of GaN for two perpendicular orientations of the linearly polarized light. The measurements were taken at 300 K under 10° grazing incidence. (b) Resulting calculated and measured XLD signature of the wurtzite structure of GaN. (a) XLD spectra at the Gd L3-edge for Gd on Ga sites (squares) and at N sites (antisites, cirles) calculated for a wurtzite Ga23GdN24 supercell. (b) Comparison between the measured (300 K) and simulated XLD spectra for 5%, 15%, and 25% of Gd on N sites. Dilute magnetic semiconductors (DMS) are considered to be useful materials which may enable the use of the spin degree of freedom inside a semiconductor device to enhance the performance. Recently long range magnetic order above room temperature has been demonstrated for the DMS Gd:GaN in the very dilute limit . This phenomenon is accompanied by a huge effective magnetic moment per Gd an effect which is even more pronounced in Gd-ion-implanted GaN . Here we present element specific investigations of Gd:GaN at the Gd L3-edge and the Ga K-edge, respectively, measuring the x-ray linear dichroism (XLD) as well as the x-ray magnetic circular dichroism (XMCD) to study the structural and magnetic properties with element specifity in order to better understand the microscopic origin of the huge effective magnetic moments as derived from integral SQUID magnetometry . The Gd:GaN(0001) sample investigated here were grown on SiC(0001) substrates using ammonia-assisted molecular beam epitaxy and has a dopant concentration of about 2 • 1019/cm3. The x-ray absorption near edge spectra (XANES) were taken at the ESRF ID 12 beamline in total fluorescence yield under 10° grazing incidence. For the XLD measurements a quarter wave plate was used to flip the linear polarization from vertical to horizontal. The XLD spectra were simulated using the FDMNES code  using the multiple scattering formalism within the muffin tin approximation. Additional in-plane magnetic measurements have been performed using a commercial SQUID magnetometer. We can demonstrate by means of XLD measurements at the Ga K-edge that the local crystal structure is wurtzite-type with high perfection as indicated by the excellent agreement witht he simulatued spectra. The XLD spectra together with respective simulations can further reveal that Gd predominantly (~85(5)%) occupies Ga substitutional sites indicating that Gd:GaN is a DMS material with little if any phase segregation and only low Gd antisite disorder. A clear XMCD signal at 40 K demonstrates that the moment per Gd atom is of the same order of magnitude as for bulk GdN, i.e. about 4 µB/atom consistent with the previously published model . Element specific hysteresis loops can be measured at the Gd L3-edge. The M(H) curve can be well-described by either a Langevin or a Brillouin function using magnetic moments close to the bulk value of Gd in agreement with the XMCD results. The comparison of the element specific hysteresis which resembles paramagnetic behavior with SQUID measurements indicating ferromagnetism demonstrates that a large portion of the overall magnetic properties does not originate from the Gd itself but is only activated by the dopant, thus highlighting the important role of the GaN host matrix for the overall magnetic properties of Gd:GaN DMS. This work was partially supported by the European Union under the Marie-Curie Excellence Grant No. MEXT-CT-2004-014195 of the 6th Framework Programme and the ESRF. S. Dhar, O. Brandt, M. Ramsteiner, V. F. Sapega, and K. H. Ploog, Phys. Rev. Lett. 94, 037205 (2005). S. Dhar, T. Kammermeier, A. Ney, L. Perez, K. H. Ploog, A. Melnikov, and A. D. Wieck, Appl. Phys. Lett. 89, 062503 (2006). Y. Joly, Phys. Rev. B 63, 125120 (2001). A. Ney1, T. Kammermeier1, E. Manuel1, V. Ney1, S. Dhar1,2, K.H. Ploog2, F. Wilhelm3, and A. Rogalev3 Applied Physics Letters 90, 252515 (2007). Normalized XANES and XMCD spectra recorded at the Gd L3-edge at 40 K. For the XMCD signal the direct difference between the normalized XANES spectra with right and left circular polarized light was taken and in addition these difference spectra were taken in a magnetic field of ±6 T. The maximum size of the XMCD signal is about 3%. Zwischen zwei magnetischen Domänen bildet sich eine Domänenwand, die durch eine inhomogene Verteilung magnetischer Momente gekennzeichnet ist. Die Frage war, ob eine Domänenwand einen elektrischen Widerstand darstellt und wie groß er ist. Die Analyse experimenteller Untersuchungen wird dadurch erschwert, dass auch andere Widerstandsbeiträge auftreten können. Zudem wurden von theoretischer Seite sowohl positive als auch negative Widerstandsbeiträge für den Domänenwandwiderstand vorhergesagt. Wir haben gezeigt, dass es möglich ist, den Widerstand einer einzelnen Domänenwand bei Zimmertemperatur quantitativ zu bestimmen. Abb. 1 zeigt eine SEM Aufnahme von der Mikrostruktur zur Messung des elektrischen Widerstandes. Im unteren Bild erkennt man eine horizontal verlaufende Leiterbahn (Breite 313 nm) aus (Co/Pt)7-Multilagen. Die in der Bildmitte senkrecht eingezeichnete gestrichelte Line deutet die Stellen an, an denen Ga Ionen mittels FIB implantiert wurden. Rechts und links von dieser Stelle befindet sich jeweils eine Platin Leiterbahn. Weiter außen liegen Gold-Streifen zur Messung des Widerstandes. Die Ga-Ionen modifizieren die (Co/Pt)7-Leiterbahnen lokal so, dass sich an dieser Stelle eine Domänenwand bildet. Mit Hilfe der Platin Leiterbahn kann die Bewegung der Domänenwand gestoppt werden. Magnetowiderstandsmessung bei Zimmertemperatur an der in Abbildung 1 gezeigten Struktur. Deutlich zu erkennen sind die Widerstandsmaxima, die darauf zurückzuführen sind, dass sich eine einzelne Domänenwand in der Leiterbahn befindet. Die Berechung des Widerstandsanstieges innerhalb der Domänenwand ergibt 1.8%. FexPt1-x nanoparticles are currently the subject of intense research activity due to their interesting magnetic properties . Chemically disordered Fe50Pt50 shows a high-temperature transformation to the ordered L10 phase which is associated with an enhancement of the orbital magnetic moment and a decrease of the mean distance between nearest-neighbour atoms by 2%. Therefore, on the one hand the x-ray absorption near edge structure (XANES) was analysed at the Pt L3,2 edges to monitor structural changes, and on the other hand the x-ray magnetic circular dichroism (XMCD) was measured both at the Fe and Pt L3,2 edges in order to investigate the orbital magnetism after thermal treatment. The wet-chemically synthesised Fe50Pt50 particles with a mean diameter of 6 nm were self-assembled on a naturally oxidised Si substrate (total coverage: about 10%) and exposed to a soft hydrogen plasma (5 Pa for 30 min) that removes the Fe oxides and the organic ligands surrounding the particles in the as-prepared state (Figure 1). Subsequently one of the samples was annealed at 600°C in situ. Scanning electron microscopy (SEM) images confirm the mean size, the centre-tocentre distance of 9 nm and a small agglomeration after annealing. For measurements at the Pt L3,2 edges, the UHV plasma chamber was attached to the experimental chamber at beamline ID12 and the Fe oxides were removed prior to the experiments. In order to be able to record high quality XANES and XMCD spectra at the Pt L3,2 edges on samples with such a low concentration of Pt, we have used a 35-channel silicon drift diode detector developed at the ID12 beamline in collaboration with Eurisys- Mesures (now Canberra Eurisys) . During these experiments the counting rates in Pt La lines were ca. 2·104 cps per channel with a peaking time of 0.5 µs. Even though the X-ray beam was impinging on the sample with an angle of incidence of ca. 15°, the beam footprint was quite small: 300x30 µm2. This is because we had to reduce the intensity of the monochromatic X-rays in order to avoid the saturation of the detector by the intense soft X-ray fluorescence signal from the substrates. The typical energy resolution of the emission spectra measured with one single SDD channel (data acquisition time: 60s; peaking time: 0.5 µs) was of the order of 132 eV for the unresolved Si Kab, 159 eV for the Fe Ka line and 202 eV for the Pt La1 line. Excellent performances of this detector allowed us to record not only the XANES spectra, but also the XMCD signals at the Pt L3,2 edges in a weak magnetic field of ± 0.6 T (Figure 2b). The quality of the experimental data was high enough to derive the local spin and orbital magnetic moments of the Pt 5d states using the XMCD sum rules. The results of this analysis together with the analysis of the spectra recorded at BESSY, Germany, on the same samples at the Fe L3,2 edges are given in Table 1. The observed trends in µl / µS eff indicate a non-cubic environment after annealing as expected for the L10 structure. Additionally, we found that the period of the first EXAFS oscillations at the Pt L3,2 edges decreased by (3±2)% after annealing indicating a reduction of the mean distance between the atoms as known for the disorderorder transformation in the corresponding bulk material. In conclusion, we demonstrated a method to prepare pure metallic Fe50Pt50 nanoparticles from wet-chemically synthesised particles. Evidence for the formation of the L10 phase is provided both by structural changes found in the oscillations of the XANES and by the changes in the magnetic moments. Table 1: Local spin and orbital magnetic moments for Fe and Pt. This work was supported by the BMBF (05 ES3XBA/5), the DFG (SFB445), the EU (MRTN-CT-2004-005566, SyntOrbMag), and the ESRF. C. Antoniak, J. Lindner, and M. Farle, Europhys. Lett. 70, 205 (2005). J. Goulon, A. Rogalev, G. Goujon et. al., J. Synch. Rad. 12, 57 (2005). Phys. Rev. Lett. 97 (2006) 117201. Silicat-gepaselte Kobalt Nanopartikel mit Durchmessern von 20 bis 30nm zeigen bei ihrer Synthese selbstorganisierte Strukturen mit ketten- und ringartigen Formationen, wenn während der Synthese schwache Magnetfelder angelegt werden (Abb.1). Verantworlich für diese selbstorganisierte Formation der Nanopartikel ist die magnetische Dipol-Dipol Wechselwirkung. Als unterer, kritischer Durchmesser der Nanopartikel für eine solche energetisch stabile Ketten-Formation wird bei der verwendeten Temperatur etwa 12nm gefunden. Mit der Methode - obwohl sehr einfach - lassen sich Perlenketten-ähnliche Strukturen erzeugen, die ansonsten nur mit viel aufwändigeren Prozessen hergestellt werden können. Molekulardynamik Simulationen, bei denen die dipolaren magnetischen Kräfte berücksichtigt werden, erlauben eine sehr gute Reproduktion der selbstorganisierten Strukturen, wie sie im Experiment beobachtet werden (Abb.2). Fe3C (Zementit) ist ein herkömmlicher Bestandteil von Stahl und dient zu dessen Härtung. Sein Gefügeanteil kann durch verschiedene Temperprozesse variiert werden, wobei Kohlenstoff-Atome interstitiell in das atomare Eisen-Gitter eingebaut sind, dessen Struktur orthorhombisch ist (Fig.1). Der gewünschte Anteil von Fe3C in Stahl wird durch die spezifische, spätere Anwendung bestimmt. Neben seiner zentralen Bedeutung für die Herstellung verschiedener Stahlsorten, hat Fe3C vor allem wegen seiner besonderen Eigenschaften in letzter Zeit neue Aufmerksamkeit für die Grundlagenforschung erlangt. Zum einen ist Fe3C unterhalb der sog. Curie-Temperatur (TC = 485 K) ein Ferromagnet. Andererseits zeigt Fe3C im Bereich von Zimmertemperatur eine nahezu verschwindende thermische Ausdehnung. Der Grund für diese verschwindende thermische Ausdehnung kann für magnetische Materialien in vielen Fällen auf sogenannte "high-moment-large-volume - low-moment-small-volume (HM-LM)" Übergänge, oder auch "Magnetovolumen Instabilität" genannt, zurückgeführt werden. Der HM-Zustand ist mit einem großen atomaren Volumen und einem magnetischen Moment von typisch 2 µB (µB: Bohrsches Magneton) verknüpft, während der (energetisch geringfügig über dem HM-Zustand liegende) LM-Zustand ein kleines atomares Volumen mit nahezu verschwindendem magnetischen Moment besitzt. Mit steigender Temperatur wird daher der LM-Zustand mit kleinerem Volumen zunehmend besetzt. Der Magnetismus liefert hier also bei steigender Temperatur einen Beitrag zur thermischen Ausdehnung, der das Material "schrumpfen" lässt. Dies wirkt der normalen thermischen Ausdehnung entgegen, so dass im Resultat eine nahezu verschwindende thermische Ausdehnung über einen großen Temperaturbereich besteht. Dieser Effekt ist als sog. "INVAR-Effekt" bekannt. Wenn ein System über HM und LM-Zustände verfügt, dann sollte es mit Hilfe eines von außen angelegten Drucks möglich sein, das System auch in den LM-Zustand mit kleinem Volumen zu zwingen, so dass das magnetische Moment verschwindet. Wenn der dazu benötigte Druck außerdem sehr klein ist, dann hätte man ein (neues) Material, das solche HM-LM Übergänge bereits dann ausführen würde, wenn man nur mit einem Hammer darauf schlägt. Diesen Effekt könnte man zur Konstruktion "magneto-mechanischer" Schalter ausnutzen, wobei dann weder elektrische Verdrahtungen noch Kontroll-Schaltkreise benötigt werden. Neben der verschwindenden thermischen Ausdehnung hätte man so eine weitere wichtige technologische Anwendung für diese HM-LM Übergänge. Um zu zeigen, dass die verschwindende thermische Ausdehnung in Fe3C auf HM-LM Übergänge zurückzuführen ist, wurde die Druckabhängigkeit des magnetischen Momentes von Fe3C studiert, das dann oberhalb eines kritischen Druckes verschwinden sollte. Zur Anwendung hydrostatischer Drücke werden Diamant-Zellen verwendet. Zur Messung des magnetischen Momentes können wegen der Größe der Diamant-Zelle und der darin verwendeten Materialien keine Standardmethoden der Magnetometrie verwendet werden. Statt dessen werden die Vorteile der magnetischen Röntgen-Absorptions-Techniken ausgenutzt. Für den Fall magnetischer Materialien zeigen links und rechts zirkular polarisierte Röntgenstrahlen nahe der Absorptionskante verschiedene Absorptionsspektren. Der Unterschied in diesen Spektren ist als magnetischer Röntgen-Zirkular-Dichroismus (XMCD) bekannt, wobei das integrierte Spektrum proportional zum magnetischen Moment ist. Dabei kann der Röntgenstrahl die Diamanten durchdringen, und "sieht" damit nur die zu untersuchende Probe. Fe3C Proben, in der Form etwa 50nm großer Partikel (Fig.2), die in einem Heißwandreaktor präpariert wurden, werden in einen Probenhalter eingebracht, der zwischen einem Paar von Diamanten positioniert wird. Röntgen-Absorptionsspektren werden für links und rechts zirkular polarisierte Röntgenstrahlung in der Nähe der K-Kante von Eisen bis zu Drücken von 20 GPa gemessen. Fig. 3 zeigt XMCD Spektren für verschiedene Drücke. Mit zunehmendem Druck wird die Intensität der gemessenen Spektren kleiner. Fig. 4 zeigt die gemessene Fläche unter den in Fig. 3 gezeigten Spektren (das integrierte XMCD-Signal) für jeden angelegten Druck, und man erkennt, dass die Schwächung der Spektren nicht monoton erfolgt, sondern relativ abrupt in der Nähe eines Drucks von 10 GPa. Dies zeigt die Existenz eines LM-HM Übergangs in Fe3C. Damit ist Fe3C das erste bekannte INVAR-Material, das nur eine einzige Metallsorte, Eisen, mit interstitieller Kohlenstoff-Komponente enthält. Es ist das bei weitem billigste Material für Anwendungen, und eröffnet darüber hinaus Möglichkeiten, neue Typen interstitieller Systeme unter Verwendung von z.B. Bor und Stickstoff so Maß zu schneidern, dass sie ebenfalls Magnetovolumen-Effekte zeigen. Diese Arbeit erscheint in Kürze in den Physical Review Letters. 2004-11 : Elektromigration - "der schnelle Tod in der Mikroelektronik"
Elektromigration - "der schnelle Tod in der Mikroelektronik"
Lange bekannt, und dennoch wenig verstanden, zumindest wenn es um die mikroskopischen Ursachen und Zusammenhänge geht. Das Phänomen der Elektromigration, also ein durch den Stromtransport hervorgerufener Materialtransport in Leiterbahnen, der letztlich zur lokalen Zerstörung der Leiterbahnen führt. Systematische in-situ elektronenmikroskopische Untersuchungen zum Verständnis der Elektromigration in Leiterbahnen aus Gold mit Abmessungen im Nanometerbereich werden in der Arbeitsgruppe von Prof. Günter Dumpich von Burkhard Stahlmecke durchgeführt. Von besonderem Interesse ist dabei das Auftreten von Elektromigration an vorgegebenen Engstellen (wie im Bild links) und kreisförmigen Aussparungen. Leiterbahnen mit vorgegebener Topologie und Abmessung werden dazu mit Elektronenstrahllithographie und lift-off Technik hergestellt. Typische Abmessungen der Leiterbahnen sind Länge l = 10 µm, Breite b = 1 µm und Schichtdicke t = 30 nm mit Engstellen von 500 nm und kleiner. Wie in der Animation (links) zu sehen, wird für solche Leiterbahnen gefunden, daß eine Voidbildung (also der Wegtransport von Material) - wie erwartet - vermehrt in der Nähe der Engstelle oder einer Aussparung stattfindet Überraschenderweise bilden sich die zugehörigen Hillocks (also die Anhäufungen des wegtransportierten Materials) in der Engstelle, also in einem Gebiet mit der höchsten Stromdichte.